In the past year a number of narco submarines have been seized in several Latin American states. Narco submarines continue to be a problem as hemispheric security forces combat drug trafficking. Unfortunately for every narco sub that is seized, another is under construction. While recent successful operations should be applauded, combating narco subs needs a regional strategy of its own. In recent months, several narco submarines have been seized in various Latin American states. For example, on 5 August, Ecuadoran marines located one in the Las Delicias area, close to the border with Colombia. 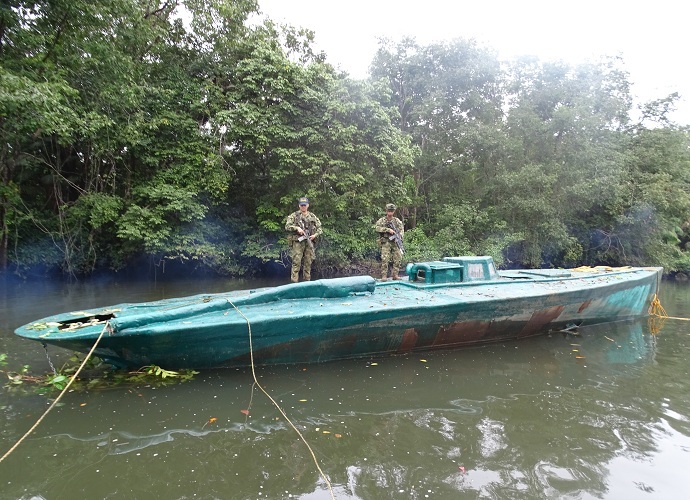 For Colombia, a narco sub was seized in an operation by army and naval personnel in the San Juan and Baudó Rivers in the Choco department in late July. The platform, which was carrying approximately four tons of cocaine, was apparently manufactured by ELN rebels. The Colombian Navy explained that this was the first time a narco sub was operating in a river, and that it probably took some five to six months to be constructed. Not long after, in mid-August, the Colombian Navy located yet another narco sub, this time in the Nariño department and with the capacity to transport up to four tons of drugs. This one measured 14 meters, with a diesel motor and propellers, the Navy explained in a communiqué. Narco subs have also been located in Central America. For example, a narco sub, reportedly 16 meters in length and capable of transporting up to five tons of drugs, was found in Guatemala in mid-April. 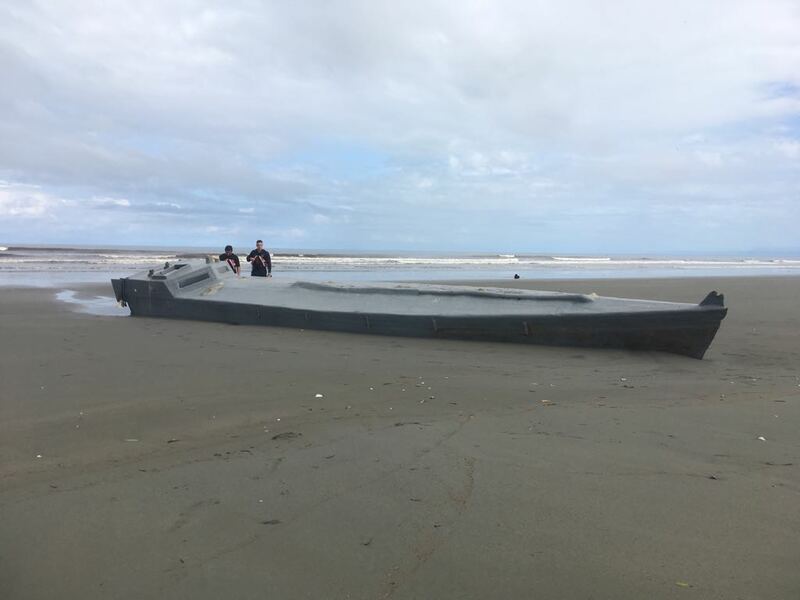 Months later, in late July, the Costa Rican Coast Guard found a similar illegal platform on a beach. Local authorities believe that the vessel, with the capacity to transport up to four tons of drugs, had a motor problem and was discarded by the crew, until it washed ashore and got stuck in the sand. The aforementioned examples highlight one fact. So far, the vast majority of narco-platforms are captured in the mainland (meaning either on dry land or “docked” in some body of water), either before they depart or upon arriving to their destination. As far as the author has been able to find, in the past couple of years, there have only been a couple of narco subs intercepted in open waters. One was in July 2015, when during a “joint operation, the U.S. Navy, U.S. Coast Guard, and assets from the Customs and Border Protection Office of Air and Marine, intercepted a “narco submarine” off the coast of El Salvador,” Business Insider explains. The platform was carrying over 16,000 pounds of cocaine. More recently, in early September 2016, the U.S. Coast Guard Cutter Waesche intercepted a narco sub in the Pacific Ocean off the Central American coast. The Cutter reportedly launched two vessels and an armed helicopter in pursuit. 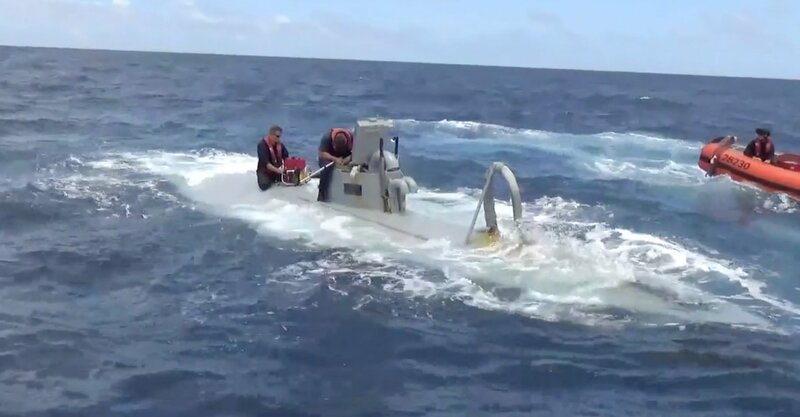 U.S. personnel caught up with the sub, apprehended five suspects, and thwarted a scuttling attempt by pumping water out of the interior of the sub.” By preventing the sinking of the sub, the USCG seized more than 5,600 pounds of cocaine, with an estimated value of USD$73 million. Who Finds The Narco Subs? Nowadays, several Latin American and Caribbean navies and coast guards are undergoing a modernization process, which includes the acquisition of new platforms. For example, Colombia and Mexico are domestically manufacturing new fleets of patrol vessels. Christian Ehrlich, a director of intelligence for Riskop, a Mexican Strategic intelligence and risk control company explained to the author that the Mexican Navy is in the process of adding Damen Sigma 10514 frigates to its fleet, “this will provide a decisive boost to Mexico’s Maritime Domain Awareness but unfortunately it will be some time before this system has an acceptable operational level” (construction for the first of the new frigates commenced in mid-August). Meanwhile The Bahamas is in the final stretch of its ambitious Sandy Bottom Project, via which it is obtaining a fleet of different patrol boats from Damen Group. Similarly, in late June IHS Jane’s reported that Louisiana-based shipbuilder Metal Shark and Damen will construct near coastal patrol vessels (NCPVs) for regional U.S. partners like “the Dominican Republic, El Salvador, Honduras, Costa Rica, Guatemala.” It is worth noting that Mr. Ehrlich, remarked how Mexico possesses aircraft like CASA CN—235 and Beechcraft King Air 350ER for ISR; Colombia also possesses similar assets. Nevertheless, in spite of more modern navies and coast guards, locating narco subs at sea continues to be a problem. In an interview with the author, Gustavo Fallas, a journalist for the Costa Rican daily La Nacion, explained that “[Costa Rica] depends on the Americans to combat [narco submarines]. In 2006 we detained a submersible with three tons [of drugs] and it was thanks to an American frigate. In 2012 we chased another one in the Caribbean, and it was also after the Americans alerted us. For those reasons it is vital to have U.S. aid to locate these platforms.” Mr. Fallas added that Costa Rica must create a shield (meaning more vessels, radars, personnel) to prevent drug traffickers from using the country as a warehouse or transit path for drugs. In other words, Central American navies will continue to rely on the U.S. (be it SOUTCHOM or the Coast Guard) to monitor maritime areas in order to combat, among other threats, narco submarines. This is problematic, since, as Mr. Pestana remarked, even U.S. security agencies have limits to their abilities, particularly nowadays when the U.S. has other security operations and geopolitical concerns around the globe. Furthermore, there is the problematic and ever-present red tape, namely, “the inability of the U.S. to respond to an identified narco submarine without permission from higher leadership. This often led to the narco submarine to either get away, or move out of the U.S. areas of operation,” the FIU expert explained. Locating a narco submarine at sea is a tricky business. In an interview with the author, Mario Pedreros, a retired Chilean Naval officer and an expert in airborne maritime patrol, provided an excellent analysis on this problem. As previously mentioned, the term narco submarine is commonly utilized for these vessels, however they are not really submarines. As Mr. Pedreros explains, these platforms are semi-submersibles, meaning that they cannot go completely underwater, and if they can do so, it is for brief periods of time. (“Narco submarine” is still a catchier name than “narco-semi-submersible” though). However, even if these vessels cannot fully dive, they are nonetheless difficult to locate at sea. Mr. Pedreros explained how some of these platforms have electronic motors, which makes them more silent than diesel engines, making them harder to find with passive sonar. “When it comes to semi-submersibles, utilizing sonar is not very efficient,” Mr. Pedreros concludes. Adding to the problem is that the vessel is pretty small, and “once at sea, the submersibles have 20 percent of their structure above the surface,” making them hard to pinpoint by radar. Mr. Pedreros recommended maritime patrol aircraft (MPA) as an ideal tool to combat narco submarines at sea, as these aircraft possess superior sensors and radars for intelligence, surveillance, and reconnaissance. Obviously, locating the target is only part of the solution, because then it has to be intercepted. “The aircraft must work with together with a vessel to capture the submersible. In other words, there are three components in this process: an aircraft (MPA), a vessel, and a light boat that can board the submersible and detain the crew,” the retired Chilean Naval officer explained. As previously discussed, various Latin American and Caribbean navies are acquiring OPVs with attached light boats, while Colombia and Mexico have platforms for maritime patrol, fulfilling the requirements by Mr. Pedreros; what is needed is greater multinational support, apart from additional platforms. It would be naïve to assume that recent successful operations by regional security forces will convince drug traffickers to stop investing in narco submarines. There is simply too much money to be made in drugs, and the subs cost only around USD$1 million to manufacture. Even if five narco subs are stopped, drug traffickers only need one or two successful deliveries to make up for their losses. Moreover, recently seized narco subs show they are becoming more technologically advanced, including bigger in size so they can transport greater quantities of contraband. 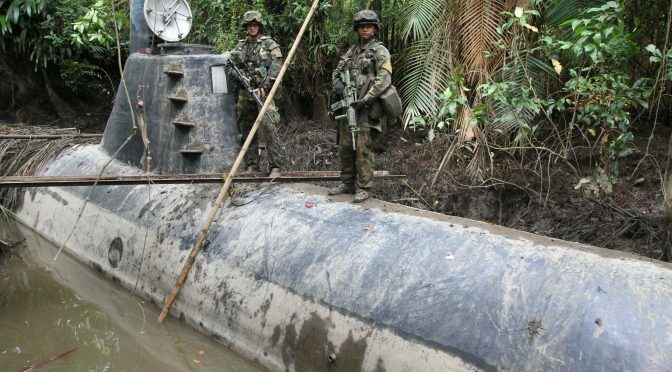 The narco sub seized in mid-July in Choco had space for a crew of four, measured 9 meters in length by 4 wide, had radars, stabilizers, ballast weights and was powered by over 100 batteries, according to the Colombian daily El Colombiano. Indeed, the (brief) history of narco subs shows a trend towards modernization, particularly as drug lords are always looking for new methods to transport drugs, from Cessna aircraft and go-fast boats during the Pablo Escobar era to drones and narco subs nowadays (though of course, narcos continue to utilize the former as well). Mr. Pestana drives this home remarking how “top drug traffickers are relatively smart and have a good grasp on technology and history.” Moreover, the attractive wages narco-organizations can afford to pay means that they can hire “former engineers or other trade workers,” as Mr. Pestana explains, to continuously improve previous designs. From a scholarly point of view, the appearance of the narco sub is a fascinating development as it highlights drug traffickers’ ingenuity as they continuously think of new ways of transporting their contraband. Unfortunately, this represents an ongoing problem for regional security forces, as new narco subs become more technologically advanced. Unfortunately, even though many narco subs have been stopped, it only takes one successful trip to make a large profit. In spite of several successful operations, combating narco submarines requires both a multiagency and multinational strategy of its own. Mr. Ehlrich stresses the necessity to disrupt the construction of these platforms (which requires cooperation between police and military units). As for when narco submarines are at sea, the Greater Central American region requires united front, such as a regional anti-narco submarine task force. By combining resources, in which member states can contribute platforms to create the three-platform interception teams that Mr. Pedreros described, this unit would ideally be more successful at locating narco subs at sea, and not just in inland waterways. This will decrease the region’s dependency on the U.S., which Mr. Pestana and Mr. Fallas highlighted. Unfortunately, narco submarines are a problem that will not sink, hence new strategies are needed in order to combat them more efficiently. Mario Pedreros, a retired Chilean Navy Officer, expert in aero-maritime patrol. He participated as a Tactical Coordinator Officer (TACCO) in different missions overseas onboard Chilean Navy P-3 Orion aircrafts. Missions include Anti Submarine Warfare, Anti Surface Warfare, Anti Terrorism missions and Search and Rescue operations. He is currently based in Washington, DC. doing consulting for several Defense and Security companies.